Here is another photo of CP, when he was in France during world war one. I recall a story my dad told me that grandpa CP was kicked out of school because he was "incorrigible" and that he wandered around for awhile then decided to sign up as a dough boy and went to France. 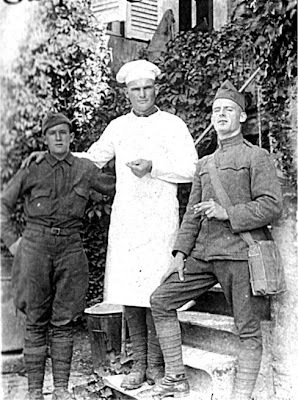 I have no idea how true that story was but here is a picture of CP in his army chef whites clowning around with a couple pals on break. 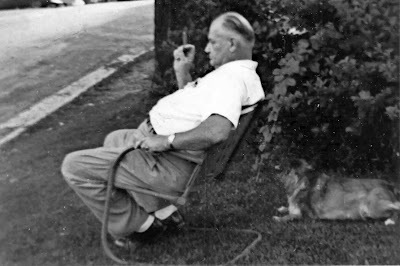 I found this photo of my grandpa CP, this is how I Remember him, laid back and pensive. My favorite memory was during one of his visits and he showed me how to make chili. Not with any recipe mind you but by just knowing what goes into chili and making it up as you go. Just for the record it started out with a couple pounds of good hamburger and a couple choped onions browned in a big cast iron skilit , a deep one, with a little salt and black pepper to taste. Once the hamburger and onion is browned add two large cans of stewed tomatos, and some chili powder to taste. That's it. As I remember, we then let it cook on a low heat all afternoon. Then I remember adding kidney beans when it was about half done. That was some of the best chili I ever had.